Thermococcus litoralis is a heterotrophic facultative sulfur dependent hyperthermophilic Archaeon, which was isolated from a shallow submarine thermal spring. It has been successfully used in a two-stage fermentation system, where various keratinaceous wastes of animal origin were converted to biohydrogen. In this system T. litoralis performed better than its close relative, P. furiosus. Therefore, new alternative enzymes involved in peptide and hydrogen metabolism were assumed in T. litoralis. An about 10.5 kb long genomic region was isolated and sequenced from Thermococcus litoralis. In silico analysis revealed that the region contained a putative operon consisting of eight genes: the fdhAB genes coding for a f ormate d eh ydrogenase and the mhyCDEFGH genes encoding a [NiFe] hydrogenase belonging to the group of the H2-evolving, energy-conserving, m embrane-bound hy drogenases. Reverse transcription linked quantitative Real-Time PCR and Western blotting experiments showed that the expression of the fdh-mhy operon was up-regulated during fermentative growth on peptides and down-regulated in cells cultivated in the presence of sulfur. Immunoblotting and protein separation experiments performed on cell fractions indicated that the formate dehydrogenase part of the complex is associated to the membrane-bound [NiFe] hydrogenase. The formate dehydrogenase together with the membrane-bound [NiFe] hydrogenase formed a formate hydrogenlyase (formate dehydrogenase coupled hydrogenase, FDH-MHY) complex. The expression data suggested that its physiological role is linked to the removal of formate likely generated during anaerobic peptide fermentation. Hyperthermophilic microorganisms, growing optimally at or above 80°C, have been isolated from a variety of geothermally heated environments . Almost all of them belong to the Archaea (Archaebacteria) domain . The majority of them are strict anaerobs and obligately dependent upon elemental sulfur (S°), which serves as terminal electron acceptor leading to H2S production. In some of the heterotrophic species, capable to grow facultatively without S°, the fermentative utilization of sugars and peptides results in the formation of molecular hydrogen . Hydrogenases responsible for hydrogen consumption and/or production belong to a diverse family of enzymes . Numerous hydrogenases belonging to various classes of [NiFe] hydrogenases have been identified and characterized in the group of heterotrophic hyperthermophilic Archaea . The [NiFe] hydrogenases are linked to wide variety of metabolic pathways in various microorganisms. Many of them catalyze hydrogen uptake but numerous [NiFe] hydrogenases produce hydrogen, as well. Their proposed physiological role is to maintain the pH and the redox balance of the cells [4, 5]. The hydrogen evolving [NiFe] hydrogenases are multisubunit membrane-bound enzymes utilizing various electron donors like ferredoxins or polyferredoxins . The prototype of the multimeric membrane-bound hydrogenases is the hydrogenase 3 in Escherichia coli, which is part of the formate hydrogenlyase complex coupling formate oxidation to proton reduction [7, 8]. In this study we focused on the H2 metabolism of Thermococcus litoralis, which was isolated from a shallow submarine thermal spring . Both T. litoralis and its close relative, Pyrococcus furiosus are well-known heterotrophic facultative sulfur dependent hyperthermophiles, members of the Thermococcus genus of the euryarchaeal order Thermococcales . These microbes preferentially utilize sugars and/or peptides for growth: the glycolysis occurs via a modified Embden-Meyerhof pathway , while amino acids derived from peptides are metabolized by transaminases and four distinct 2-keto acid oxidoreductases into their corresponding coenzyme A derivatives . Two acetyl-CoA synthetases transform the CoA derivatives to organic acids with concomitant substrate-level phosphorylation to form ATP . Depending on the redox status of the cell, 2-keto acids can be decarboxylated to aldehydes which are further oxidized to carboxylic acids by aldehyde:ferredoxin oxidoreductase (AOR) [14, 15]. Another enzyme, formaldehyde:ferredoxin oxidoreductase (FOR) is also thought to be involved in the catabolism of amino acids [15, 16]. Two soluble heterotetrameric NAD(P)-reducing (Hyh1, Hyh2) and one energy conserving multisubunit membrane-bound (Mbh) [NiFe] hydrogenases were identified in P. furiosus [17–19]. Based on bioenergetics considerations the membrane-bound hydrogenase was suggested to be mostly responsible for the hydrogen evolving capacity of the cells while the soluble bidirectional hydrogenases were proposed to have redox fine tuning role [20, 21]. So far, only a cytoplasmic [NiFe] hydrogenase (Hyh1) was characterized from T. litoralis , and evidences were found for the presence of the genes of the second soluble (Hyh2) (GenBank accession no. : EU024408) as well as the membrane-bound hydrogenase (Mbh) (our unpublished results). T. litoralis has been successfully used in a two-step fermentation system, where various keratinaceous wastes of animal origin were converted to biohydrogen . In this system T. litoralis performed better than P. furiosus. Therefore, new alternative enzymes involved in peptide and hydrogen metabolism were hypothesized in T. litoralis. Here, we report the isolation and characterization of an operon from T. litoralis, which codes for a complex that is composed of subunits which show high sequence similarity to the components of the non-energy-conserving formate hydrogenlyase (formate dehydrogenase coupled hydrogenase complex, FDH-MHY) system of E. coli . Experimental evidences were provided that the formate dehydrogenase subunits were associated to the hydrogenase bound to the membrane, therefore it is suggested that they formed a formate hydrogenlyase complex. Usually, formate hydrogenlyases play a role in sugar metabolism however, the FDH-MHY complex in T. litoralis seems to be linked to the peptide metabolism. Two genes coding for proteins similar to the α and β subunits of various microbial formate dehydrogenases were identified during the isolation of hyh-1 operon of T. litoralis . As formate dehydrogenases often form complexes with hydrogenases (formate dehydrogenase coupled hydrogenase, FDH-MHY), the genomic region downstream from these genes was investigated in detail (Table 1). A 10.5 kb genomic region was isolated in two steps from T. litoralis partial genomic DNA libraries (see Materials and Methods,) (Fig. 1A). Nine open reading frames could be identified; all of them were preceded by conserved ribosomal binding sites. Nucleotide sequence of the primers used in the RT-PCR experiments. The genomic organization and transcription of the fdh-mhy operon. A. Restriction map of the isolated 10.5 kb long T. litoralis genomic fragment and the genetic organization of the fdh-mhy genes. The main subclones are indicated by arrows. B. The products of the RT-PCR experiments performed to prove that the fdh-mhy genes are located on a single mRNA. cDNA was made using the fhl8frC1R primer, and the amplified regions is indicated with bold lines. Lane 1,17: GeneRuler™ 1 kb DNA Ladder (Fermentas). Templates: lane 2,5,8,11,14: genomic DNA template, lane 3,6,9,12,15: RT(-) experiment lacking reverse transcriptase, lane 4,7,10,13,16: RT(+) experiment. Primers: lane 2–4: fhlBR2-fhlBN1, lane 5–7: fhl02N-fhl03R, lane 8–10: fhl802N-fhl07R, lane 11–13: fhl05R-fhl09N, lane 14–16: fhl8frC1R-fhl12N. The deduced gene products of the first eight genes showed similarity to the subunits of molybdopterin oxidoreductases and energy conserving [NiFe] hydrogenases. The protein encoded by the ninth gene (mnhF) seemed to be out of our interest. The most important results derived from the BLAST search are summarized in Table 2. The results obtained from the in silico analysis are summarized below. Properties of the deduced gene products of the T. litoralis fdh-mhy operon. The 71.6 kDa protein is similar to the members of the molybdopterin oxidoreductase family, primarily to formate dehydrogenases. It contains one [FeS] cluster binding motif and a molybdopterin cofactor binding site. It is to note, that in many hyperthermophilic archaeal oxidoreductases the molybdenum is replaced by tungsten . This 18.5 kDa protein contains two ferredoxin-type CxxCxxCxxxC motifs, suggesting the binding of two [4Fe-4S] clusters. It resembles the iron-sulfur binding subunits of different molybdopterin oxidoreductases like the iron-sulfur related protein of Pyrococcus abyssi formate dehydrogenase and the HycB subunit of E. coli hydrogenase-3. The latter is thought to play role in the electron transport between the formate dehydrogenase and the hydrogenase in the E. coli formate hydrogenlyase system (FHL-1) [7, 8]. There is also similarity to the electron transport subunit of Rhodospirillum rubrum CO dehydrogenase electron transport subunit (CooF), which connects the CO dehydrogenase to the membrane-associated hydrogenase . The mhyCDE genes code for highly hydrophobic proteins with various numbers of membrane spanning helices (see Table 2). The MhyC (49 kDa), D (65.7 kDa) and E (32 kDa) subunits showed similarity to the NuoL, NuoN, and NuoH membrane proteins of E. coli, respectively. All three proteins also resemble the subunits of various Na+/H+ antiporters and membrane-bound hydrogenases. All conserved motifs characteristic for the large subunits of [NiFe] hydrogenases can be identified in the MhyF, which has 62.4 kDa molecular mass. These include the four cysteines (two CxxC motifs: one at the N- and one at the C-terminal region of the protein) responsible for the binding of the [NiFe] center . At the C-terminal region, the CxxC stretch is part of the DPCxxCxxR motif followed by a C-terminal extension, which is usually cut off by a protease during the posttranslational maturation process . Multiple alignment of the MhyF and the large subunits of various [NiFe] hydrogenases from the group of H2-evolving, energy-conserving, membrane-associated hydrogenases revealed an N-terminal extension, which was present only in the MhyF subunit and in the hydrogenase large subunits of the formate hydrogenlyase systems (E. coli HycE , HyfG ). This stretch was proposed to play a role in the interaction between the two enzymes the hydrogenase and the formate dehydrogenase . The deduced protein of 18.7 kDa is similar to the iron-sulfur cluster containing hydrogenase subunits. The easily recognizable two ferredoxin-type CxxCxxCxxxCP motifs suggested the presence of two [4Fe-4S] clusters, thus MhyG seems to represent an electron transfer subunit. The corresponding subunits of other hydrogenases like HycF in E. coli, were proposed to play a role in the electron transport [7, 8]. Based on sequence comparison, the 29.6 kDa MhyH might correspond to the small subunit of [NiFe] hydrogenases. It contains the [4Fe-4S] cluster binding CxxCxnGxCxxxGxmGCPP (n = 61–101, m = 24–61) motif characteristic for the [NiFe] hydrogenase small subunits . There is no N-terminal leader sequence responsible for TAT-type protein targeting , which suggests that the hydrogenase is associated with the cytoplasmic side of the membrane and that the complex has an endogenous substrate. The genomic organization of the genes suggested that they formed one transcriptional unit. The gene cluster was preceded by a typical archaeal promoter with the TATA box, INR and BRE regions . After the last gene (mhyH), an archaeal transcriptional termination signal could be found: a hairpin-loop forming palindrom followed by an oligo(dT) region . To prove that the fdh-mhy genes form one transcriptional unit, a primer designed to the 3' end of the last gene mhyH (fhl8frC1R, see Table 1) was used for cDNA synthesis. PCR was performed with primer pairs that correspond to various regions of the operon (see legend of Fig. 1B and Table 1). The results clearly showed that a single transcript contained all eight genes (Fig. 1B). The presence of alternative transcripts cannot be excluded but there is no indication for other promoters within the operon. To investigate the physiological role of the Fdh-Mhy proteins, transcriptional regulation of the operon was studied in reverse transcription linked absolute quantification Real-Time PCR experiments. RNA was isolated from cells grown in the following media: defined medium containing amino acids (D), D supplemented with maltose (DM), peptides (DP) or both (DMP) (see Materials and Methods). The primer used for reverse transcription was in the mhyH gene and the quantification was performed by primers located in the mhyF gene (see Fig. 2A legend and Table 1). The results are shown in Fig. 2A. The lowest transcription level could be seen in samples grown on defined medium containing amino acids (D) and maltose supplemented D medium (DM). Cells grown on DP medium (containing 0.5% casein hydrolysate) had the highest transcription level, while cells cultivated in DMP medium had a slightly higher gene expression level than in the sample grown on DM. Clearly, if the amount of peptides in the medium is high, the transcription level of the operon is also high (DP); while in the presence of maltose the transcription level is reduced (DMP). Therefore, the physiological function of the complex coded by fdh-mhy operon seemed to be related to peptide metabolism. Gene expression studies with reverse transcription linked absolute quantification Real-Time PCR and immunoblotting. A. Relative transcription level of fdh-mhy operon in cells grown on different carbon sources (M and P denotes for the maltose and peptide (casein hydrolysate) content of the medium, respectively, see Materials and Methods). The transcription level of the fdh-mhy operon in cells grown on DP medium was taken as 100 %. For reverse transcription RNA was purified from three parallel cultures, cDNA was made using the fhl8frC1R primer designed to the 3' end of mhyH. In the Real-Time PCR a primer pair (fhl10N-fhl05R) designed to the mhyF gene was used. B. Effect of sulfur on the transcription level of fdh-mhy operon (M, P and S denotes for the maltose, peptides (casein hydrolysate) and sulfur content of the medium, respectively, see Materials and Methods). For reverse transcription RNA was purified from three parallel cultures, cDNA was made with fhl805R primer designed to the 3' end of mhyC. In the Real-Time PCR a primer pair (fhl805R-fhl806N) designed to the mhyC was used. C. D. Western blotting of the same samples as in A (C) and B (D). In the immunoblotting experiments 20 μg total cellular protein, derived from the same cultures as above, was separated on 12% SDS polyacrylamide gel after boiling in SDS-loading buffer for 10 min. Proteins were blotted on nitrocellulose membrane and the FdhB protein was detected using anti-FdhB antibody. We also investigated the effect of sulfur on the transcription level of the fdh-mhy operon in cells grown on DM (DMS) and DP (DPS) media. Adding sulfur to the medium stimulates the cell growth in certain heterotrophic Archaea. This is probably due to the presence of (an) alternative pathway(s) for removal of the excess reducing power. In these cases, H2S is produced beside H2. Therefore, the expression level of the hydrogenase genes was expected to depend on sulfur. Primer pairs designed to various parts of the operon (including that pair used in the previous section) gave the same results as the experiments presented. Fig. 2B shows that the presence of sulfur has a negative effect on the expression of the fdh-mhy operon in peptide-grown cells, while in the case of maltose containing medium (where the expression is already low) the expression was sulfur independent. The effect was confirmed in both cases by Western blotting using polyclonal antibody raised against FhyB (Fig. 2C, D). In silico analysis of the Mhy subunits revealed few transmembrane components of the Mhy complex (Table 2). To establish the cellular localization of the Fdh-Mhy complex, soluble and membrane fractions were prepared from T. litoralis cells and were investigated by Western blotting technique using anti-FdhB antibody (Fig. 3A). The majority of the FdhB was found in the soluble fraction, but considerable amount of the protein could also be detected in the membrane fractions even after two washing steps (see Materials and Methods). This suggests that FdhB, and likely the other hydrophilic proteins of the complex, are associated – although loosely – to the membrane. Cellular localization of FdhB (A), hydrogenase activity staining in native PAGE (B) and immunoblot with anti-FdhB (C). A. Immunoblotting of T. litoralis soluble fraction (S1), supernatant of the first (S2) and second (S3) wash of membrane fraction as well as the washed membrane fraction (WM). Proteins were separated on 12% SDS polyacrylamide gel after boiling in SDS-loading buffer for 10 min and the FdhB subunit was monitored using anti-FdhB antibody. One thousandth of the volume of the prepared fractions was loaded onto the gel to make the signals comparable. B. Proteins were separated on 6% native gel and stained for hydrogenase activity. S: soluble fraction M: unwashed membrane fraction WM: washed membrane fraction. The buffer used for the washing step contained 1% dodecyl-β-D-maltoside and 750 mM 6-aminohexanoic acid in 50 mM Bis-Tris pH 7.0. The unsoluble materials were removed by centrifugation at 50000 × g for 20 min and the supernatants were loaded onto the gel. C. The proteins from the activity stained gel were transferred to nitrocellulose membrane and screened with anti-FdhB antibody. The hydrogenase activity band corresponding to the FdhB signal is indicated with an arrow. The membrane fractions were assayed for hydrogenase activity. The purity of the membrane fractions was checked by measuring the glutamate dehydrogenase activity exclusively present in the cytoplasmic fraction . In each case, less then 2% of the total glutamate dehydrogenase activity was found in the membrane fraction. Strong hydrogenase activity could be detected in the membrane according to both the hydrogen evolution and uptake assays. Furthermore, we could detect formate-dependent H2 evolution, but characterization of this activity was difficult due to the extreme oxygen sensitivity of the formate dehydrogenase enzyme. Sequencing of a part of the so-called membrane-bound hydrogenase operon (mbh) indicated the presence of another hydrogenase in the membrane fraction (our unpublished results). To separate the possible different hydrogenases from each other, the cell fractions were run on standard native PAGE  and stained for hydrogenase activity. The soluble and the washed membrane fractions showed completely different activity patterns, while in the unwashed membrane fraction, activities specific for both the membrane and the soluble fractions could be seen (Fig. 3B). 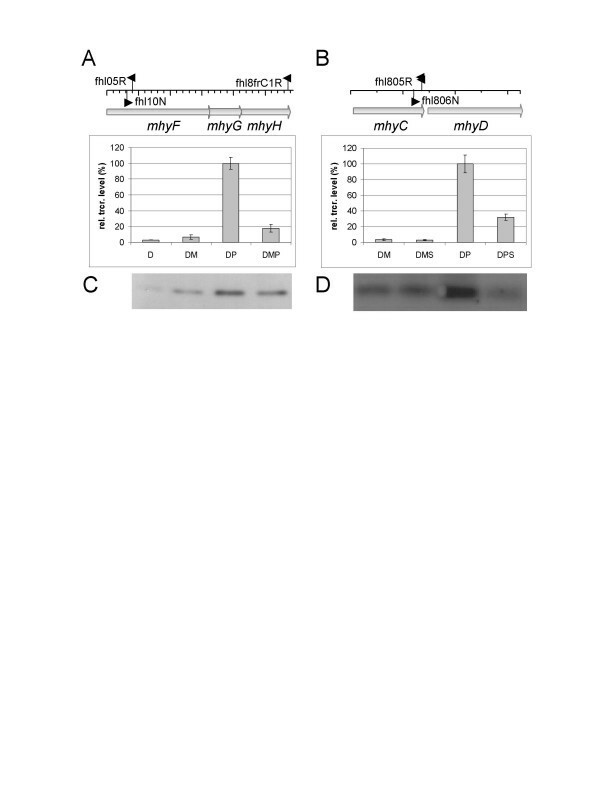 Using the anti-FdhB antibody, immunoblot analysis of the activity stained gels was performed to identify the hydrogenase activity band corresponding to the enzyme coded by the mhy operon (Fig. 3C). In the immunoblotting experiments, we could detect FdhB, its migration position coincided with one of the membrane fraction specific hydrogenases. FdhB could not be detected in the soluble fraction analyzed in a native gel, although the majority of it could be found in this fraction (see Fig. 3A). We believe that FdhB may have certain physico-chemical properties, which did not allow it to migrate into the native gel. Based on these results, we concluded that comigration of FdhB and the hydrogenase is not accidental but the aftermath of their association. Unfortunately, the purification of the complex to homogenity failed even when purification was attempted in an anaerobic workstation. The hydrogenase enzyme quickly lost its activity upon exposure to oxygen and only one chromatography step could be performed without losing the activity. Various chromatographic methods were attempted and the best results were obtained with ceramic hydroxyapatite chromatography (see Materials and Methods). Fractions eluted from the ceramic hydroxyapatite column were assayed for hydrogen evolution activity. The active fractions (fr.8., fr.22, fr.30–31) were analyzed both by native CN-PAGE  with activity staining (Fig. 4A) and by Western blotting (Fig. 4B). The results clearly showed that the FdhB protein and the membrane-bound hydrogenase copurified: both the hydrogenase activity and FdhB immuno-signal could be detected in the fraction 8. The hydrogenase activity in the fraction 22 could be another membrane-bound hydrogenase or a FdhB free form of the Fdh-Mhy complex. It seems that a small portion of the hydrogenase part of the Mhy complex is bound to the column and eluted in fraction 30 and 31. The reason for this phenomenon is unclear. Activity staining (A) and immunoblot analysis (B) of the CHT chromatography fractions having hydrogenase activity. A. Proteins were separated by 5–13% gradient CN-PAGE and stained for hydrogenase activity. The fractions of the CHT chromatography were concentrated (Millipore Amicon® Ultra centrifugal filter devices, cut-off 100 kDa) then the buffer was replaced by 1% dodecyl-β-D-maltoside and 750 mM 6-aminohexanoic acid in 50 mM Bis-Tris pH 7.0 The unsoluble materials were removed by centrifugation at 50000 × g for 20 min and the supernatants were loaded onto the gel. B. Proteins were separated on 12% SDS polyacrylamide gel after boiling in SDS-loading buffer for 10 min, transferred to nitrocellulose membrane and screened with anti-FdhB antibody. M fr. : membrane fraction that was loaded onto the CHT column. The numbers mean the numbers of the fractions analyzed. The presence of multiple hydrogenases in microorganisms implies that various hydrogenases may be linked to alternative metabolic pathways. So far, only one hydrogenase, the cytoplasmic hydrogenase-1 (Hyh1), was characterized from T. litoralis . However, the genes of Hyh2 (GenBank accession no. : EU024408) and a region of the membrane-bound hydrogenase (mbh) genes were also identified (our unpublished results). An operon, consisting of eight genes (fdhAB-mhyCDEFGH), was isolated and sequenced from T. litoralis. The operon codes for a formate dehydrogenase and a [NiFe] hydrogenase which belongs to the group of H2-evolving, energy-conserving membrane-associated hydrogenases. Remarkably, the operon could be found only in P. abyssi among the four closely related species (P. furious , P. abyssi , Pyrococcus horikoshii , Thermococcus kodakaraensis ) whose genomes were sequenced, although the other soluble and membrane-associated hydrogenases are widespread among the members of the Thermococcaceae family. The genomic context and transcriptional analysis of the genes indicated that the Fdh-Mhy proteins form a functional complex and in silico analysis predicted that few subunits (MhyCDE) are integrated membrane proteins. Western blotting experiments using anti-FdhB antibody revealed that the hydrophilic FdhB protein is also attached to the membrane, although large portion of FdhB could be detected in the soluble fraction. Protein purification and separation experiments, combined with activity staining and immunological detection, were performed to demonstrate that the membrane-bound hydrogenase was associated with the formate dehydrogenase subunits. Formate driven hydrogen evolution could also be detected, but this activity was not fully reproducible, probably due to protein sensitivity. Comprehensive in silico analysis made it unlikely, that except for formate, any other substrate of the FdhAB dimer (nitrate, DMSO or TMA) could be considered. Therefore, it was concluded, that the FdhAB-MhyCDEFGH proteins formed a membrane-bound formate dehydrogenase coupled hydrogenase (FDH-MHY) complex, although the subunits of the formate dehydrogenase seemed to be dissociable from the other part of the complex. There are a few reactions or pathways leading to formate formation in various microbes including the pyruvate , the methane , the glyoxylate and dicarboxylate [41, 42] and the amino acid metabolism . Formate should be present also in the metabolism in these cells, as usually at least one formate dehydrogenases can be found in the members of the Thermococcaceae family [35–38]. In E. coli the formate hydrogenlyase is responsible for the removal of formate to prevent the cytoplasm from acidification . Formate is generated from pyruvate by the pyruvate formate lyase enzyme . Searching for the four known hyperthermophilic genomes, we could find pyruvate formate lyase (PFL) only in T. kodakaraensis, but not in P. abyssi, where the fdh-mhy homologous genes are present. Instead, in the known members of Thermococcaceae family usually pyruvate is oxidized by a pyruvate-ferredoxin oxidoreductase (PFOR)  leading to the formation of reduced ferredoxin, which is utilized directly by the membrane-bound hydrogenase (Mbh) . Alternatively, the reduced ferredoxin can be converted to NAD(P)H by ferredoxin:NAD(P) oxidoreductase (FNOR) and the reduced NAD(P)H serves as substrate for the cytoplasmic heterotetrameric hydrogenases [21, 46]. Therefore, it seems that the pyruvate metabolism is strongly linked to the hydrogen metabolism (Mbh and soluble hydrogenases) via ferredoxin produced by the PFOR, but no indication could be found for production of formate from pyruvate. Presuming that FDH-MHY are linked to similar pathways for both P. abyssi and T. litoralis, it seems unlikely that pyruvate is the formate donor for the FDH-MHY complex in these microbes. Moreover, gene expression study disclosed that the complex is highly upregulated (more than one order of magnitude) in cells grown on peptide containing medium (DP medium) as compared to the samples grown on medium containing only amino acids (D) or D supplemented with maltose (DM). Hyperthermophilic heterotrophic microorganisms usually show poor growth on medium containing single amino acids. This might be due to either the restricted capacity of the cells to take up several essential amino acids or the greater thermal instability of single amino acids as compared to the peptides, or both . This might explain the low expression level in D medium. Most hyperthermophilic heterotrophs, including T. litoralis, are known to prefer peptide over carbohydrates, but addition of maltose to the peptide containing media was reported to stimulate growth . Consequently, in these cases both type of carbon sources are utilized. This might elucidate the reduced level of the fdh-mhy mRNA in carbohydrate supplemented peptide containing media (DMP). In the case of DM medium, the cells use maltose as main carbon source instead of amino acids and under these conditions the fdh-mhy genes were weakly transcribed. It is to note that the fdh-mhy transcript level in the cells grown in DM medium is slightly higher than in the cultures cultivated in basic (D) medium. However, this increase is negligible as compared to the activation occured in the samples grown in the presence of peptides (DP). No obvious explanation can be given for this slight – but detectable – activation by maltose. Therefore, it was concluded that the FHL complex is linked to the peptide rather than to the carbohydrate metabolism. Addition of sulfur to the medium suppressed the induction by peptides, probably due to the appearance of alternative, more favorized pathways. Unfortunately, the amino acid metabolism is not well understood in hyperthermophilic archaea. Transaminases and four distinct 2-keto acid oxidoreductases are involved in the conversion of amino acids into their corresponding coenzyme A derivatives . There are pathways, in which 2-keto acids generated from amino acids are decarboxylated to aldehydes and then further oxidized to carboxylic acids . Two aldehyde oxidizing enzymes were isolated from T. litoralis, these are the aldehyde:ferredoxin oxidoreductase (AOR) and the formaldehyde:ferredoxin oxidoreductase (FOR) [15, 24]. FOR can convert only C1-C3 aldehydes in vitro, its physiological function is not completely understood, but believed to participate in the catabolism of basic amino acids . Moreover, in vitro both AOR and FOR can use formaldehyde as a substrate and produce formate [15, 24], therefore enzymes for the endogenous formation of formate are potentially present in T. litoralis. In T. litoralis, the presence of a formate dehydrogenase associated [NiFe] hydrogenase (formate hydrogenlyase) complex was demonstrated which was likely involved in the removal of formate generated during peptide catabolism. This might have an important practical consequence. In a two stage system converting keratin-containing biowaste to biohydrogen, T. litoralis showed better performance than P. furiosus  and this "amino acid – formate – hydrogen" pathway might be responsible for this better efficacy. Thermococcus litoralis DSM 5473 was maintained in complex medium (CM) under strictly anaerobic conditions at 85°C . For the gene expression experiments, cells were grown in defined medium (D), in D supplemented with 0.5 % (wt/vol) maltose (DM) or 0.5 % (wt/vol) casein hydrolysate (DP) or maltose and casein hydrolysate (DMP). If sulfur was also added in a 1 % concentration, it is indicated by "S". D medium (per liter): NaCl 24 g, MgCl2 × 6H2O 10.6 g, Na2SO4 4 g, CaCl2 × 2H2O 1.5 g, KCl 0.7 g, NaHCO30.2 g, KBr 0.1 g, SrCl2 25 mg, H3BO3 30 mg, Na2WO4 × 2H2O 3 mg, K2HPO4 140 mg, FeSO4 × 7H2O 1.4 mg, MnSO4 × 7 H2O 0.5 mg, CoSO4 × 7 H2O 0.36 mg, NiCl2 × 6 H2O 0.2 mg, Na2MoO4 × 2 H2O 1 μg, CuSO4 × 5 H2O 1 μg, pyridoxine-HCl 0.1 mg, p-aminobenzoic acid 0.05 mg, nicotinic acid 0.05 mg, DL-Ca-panthotenate 0.05 mg, thiamine-HCl 0.05 mg, DL-6,8-lipoic acid 0.05 mg, riboflavin 0.04 mg, biotin 0.2 mg, folic acid 0.02 mg, 200 mg of each of the 20 amino acids, adenine 10 mg, uracil 10 mg, resazurin 0.2 mg, cysteine 0.4 g, (pH 6.5). E. coli XL1-Blue MRF' and E. coli BL21(DE3) CodonPlus-RIL (Stratagene) cells were used for cloning and protein overexpression, respectively. E. coli strains were cultivated in Luria-Bertani medium  at 37°C, antibiotics were used at the following concentrations (μg·ml-1): ampicillin (100), kanamycin (50), and tetracycline (10). All cloning and DNA manipulation steps were performed following the standard practice . The isolated DNA fragments were usually subcloned into pBluescript SK+/- (Stratagene) vector. Southern blotting, hybridization, colony and plaque hybridizations were performed according to the standard practice  and the manufacturer's instructions (Roche). The probes were digoxigenin labeled and visualized colorimetrically as described by the supplier (Roche). Two genes encoding for the formate dehydrogenase subunits were sequenced previously . For sequencing the whole cluster, T. litoralis partial genomic DNA library from Eco RI-Xba I digested genomic DNA was prepared in pBluescript SK+ vector. The labeled insert of pLHU1/1 clone was used to fish out the clone pFhl6 (Fig. 1A. ), which was further subcloned and sequenced. 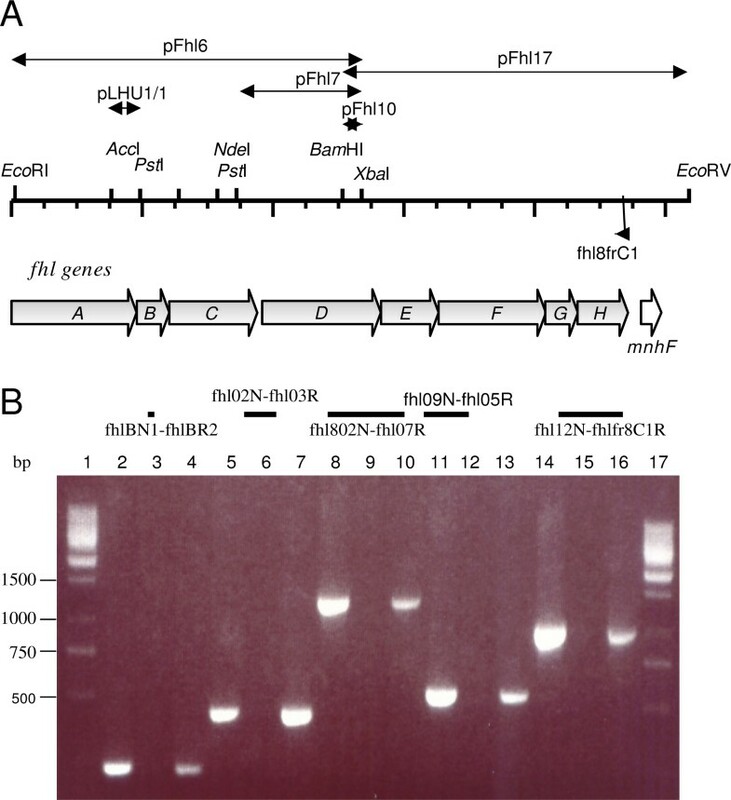 As a next step, the labeled fragment of the pFhl10 was used to isolate the pFhl17 clone from Bam HI-Eco RV T. litoralis partial genomic DNA library. These fragments were subcloned and their nucleotide sequences were determined on both strands by an Applied Biosystems 373 Stretch DNA sequencer. Comparison of nucleotide and amino acid sequences were carried out with BLAST programs . Multiple alignments were done with ClustalW 1.8 . Membrane spanning helices were predicted by the HMMTOP software [52, 53]. Cells grown to mid-logarithmic phase were harvested and total RNA was extracted using Tri-Reagent™ (Sigma) following the manufacturer's instructions. RNA was further treated with RNase-free DNaseI to remove any residual DNA and was quantified by NanoDrop ND-1000 spectrophotometer (NanoDrop Technologies). The integrity of the RNA preparation was verified by gel electrophoresis according to Ausubel et al. .
From the DNA-free RNA preparation typically 1 μg RNA was reverse transcribed into cDNA using RevertAid™ H Minus M-MuLV Reverse Transcriptase (Fermentas) (in 20 μl final volume) and 1 μl aliquot of this mixture was used in the amplification reactions. Negative control reactions were performed by omitting the reverse transcriptase. The primers used for the reverse transcription and amplification reactions are listed in Table 1. PCR was done in PCRExpress thermocycler (Hybaid). Absolute quantification Real-Time PCR was performed in 7500 Real-Time PCR System (Applied Biosystems), using SYBR® Green PCR Master Mix (Applied Biosystems). In the absolute quantification experiments a tenfold dilution series of the plasmids (pFhl7 and pFhl17) harboring the genomic region of interest was used for calibration. His-tagged FdhB was overexpressed in E. coli BL21(DE3) CodonPlus-RIL (Stratagene) using pET32a vector (Novagene), and purified on IMAC column as described previously . Polyclonal antibody was produced in rabbits. The immunization and the recovery of the IgG fraction from the serum were carried out according to standard methods . The crude IgG fraction was further purified on DEAE Affi-Gel Blue Gel column (Bio-Rad). Preimmune serum was also prepared and used in control experiments to prove the specificity of the Anti-FdhB antibody. Both ELISA and Western-blotting showed that the Anti-FdhB antibody specifically interacted with FdhB. SDS-PAGE and native PAGE were executed according to Ausubel et al. , Colourless Native PAGE (CN-PAGE) was performed as described by Schagger et al. . Proteins were transferred to ECL+ Nitrocellulose membrane (Amersham Biosciences) from polyacrylamide gel using Trans-Blot® SD Semi-Dry Electrophoretic Transfer Cell (BioRad). 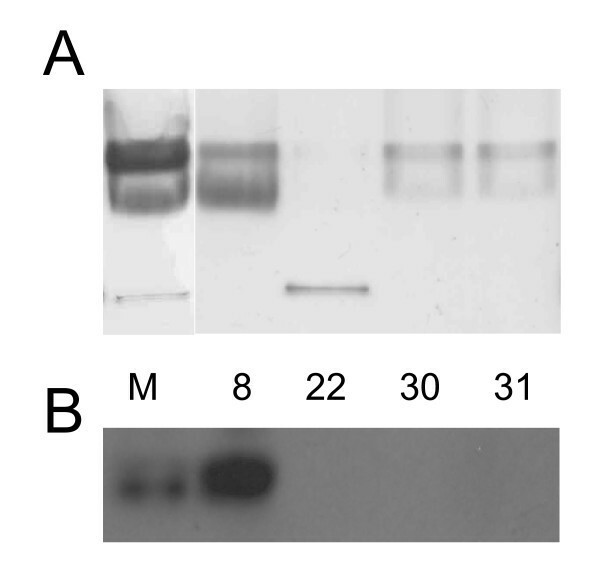 Membranes were hybridized with anti-FdhB antibody (1:100 diluted, protein concentration: 6 mg/ml) and incubated with 1:10000 diluted horseradish peroxidase conjugated anti-rabbit secondary antibody (Amersham Biosciences). Reporter protein activity was detected using ECL plus Western Blotting Detection System (Amersham Biosciences). T. litoralis cells suspended in 50 mM Tris-HCl buffer (pH 8.0) were disrupted with a French Pressure Cell (ThermoIEC, French® Press) at 20000 psi. The cell debris was removed with centrifugation at 20000 × g for 20 min. The supernatant was centrifuged at 100000 × g, at 4°C for 1.5 hours. The pellet was washed twice with the same buffer as above and was considered as membrane fraction. Hydrogen uptake activity was measured anaerobically by H2-dependent reduction of benzyl viologen (0.4 mM) in 50 mM Tris-HCl buffer (pH 8.0) in rubber stopper-sealed glass cuvettes at 80°C. The absorbance changes were recorded in Unicam UV/VIS-UV2 spectrophotometer at 600 nm. H2 evolution was measured using methyl viologen (3 mM) as electron donor in 50 mM Tris-HCl buffer (pH 8.0) at 80°C by gas chromatography (model 6890N, Agilent Technologies). The reaction was started by adding sodium dithionite (up to 30 mM final concentration). Hydrogenase activity staining of native polyacrylamide gels: the gel was placed in a flask containing 200 ml of 50 mM Tris-HCl (pH 8.0) buffer and 1 mM benzyl viologen. It was flushed with nitrogen for 20 min then with hydrogen at 85°C. After the appearance of the activity bands 2,3,5-triphenyl-tetrazolium-chlorid was added to a final concentration of 20 mM to stabilize the staining. Glutamate dehydrogenase activity was followed by glutamate driven reduction of NADP+ measured at 340 nm in 20 mM sodium phosphate buffer (pH 7.0) containing 6 mM sodium glutamate and 0.4 mM NADP+ . Membrane fractions (prepared in 20 mM phosphate buffer (pH 7.0) instead of Tris-HCl as above) were loaded onto a ceramic hydroxyapatite column (CHT® Ceramic Hydroxyapatite (BioRad)) equilibrated with 10 mM potassium phosphate buffer (pH 7.0) containing 2 mM DTT (in few cases 1% dodecyl-β-D-maltoside and 750 mM 6-aminohexanoic acid in 50 mM Bis-Tris pH 7.0. were used for solubilization, but they did not improve the separation). Proteins were eluted using a linear gradient from 10 to 500 mM potassium phosphate. Anaerobic protein purification was done in a Bactron IV (Shel-Lab) anaerobic chamber. The 10474 bp long sequence containing fdhAB-mhyCDEFGH genes was deposited in GenBank under the accession number AF039208. This work has been supported by EU 6th Framework Programme projects (HyVolution SES6 019825 and NEST STRP SOLAR-H 5166510) and by domestic sources (KNRET, DEAK KKK, NKFP, GVOP). MT carried out the isolation of fdh-mhy operon, did the Western blot and Real-Time experiments and measured the enzyme activities. AT did the RT-PCR and helped to design the Real-Time PCR experiments. BB overexpressed and purified the FdhB protein for antibody production. Chromatography steps during protein purification were done by AV. GR took part in the isolation of fdh-mhy operon and participated in the design of the study and helped to draft the manuscript. KLK participated in the design and coordination of the study and helped to draft the manuscript.